This easy slow cooker French Dip sandwich made with rump roast and homemade aus jus (no seasoning packets required) is super simple and absolutely delicious. I was at a cozy Irish pub on a lazy Saturday afternoon (this was clearly pre-kids), taking in the dark wood, lively conversation, crowded booths, and Guinness signs. I’d just been served a cold pint of ale, and needed something that would complement both the beer and the atmosphere. The French Dip sandwich with horseradish and aus jus called my name. I still remember that first dip of the sandwich — the crusty bread submerged into the salty, beefy aus jus was flavor and texture heaven. 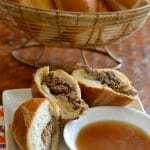 After I found myself craving that French Dip, I started checking out some of the popular French Dip recipes online. Many of them either called for store-bought flavoring packets or had a few too many steps and ingredients for my liking. Since I couldn’t find exactly what I was looking for, I decided to create a recipe of my own. It turned out SO good, you guys. Even my harshest critics (my girls) gave it two thumbs up. Most of that delicious aus jus flavor comes from the beef itself, so there was no need to get all crazy with a bunch of extra ingredients. 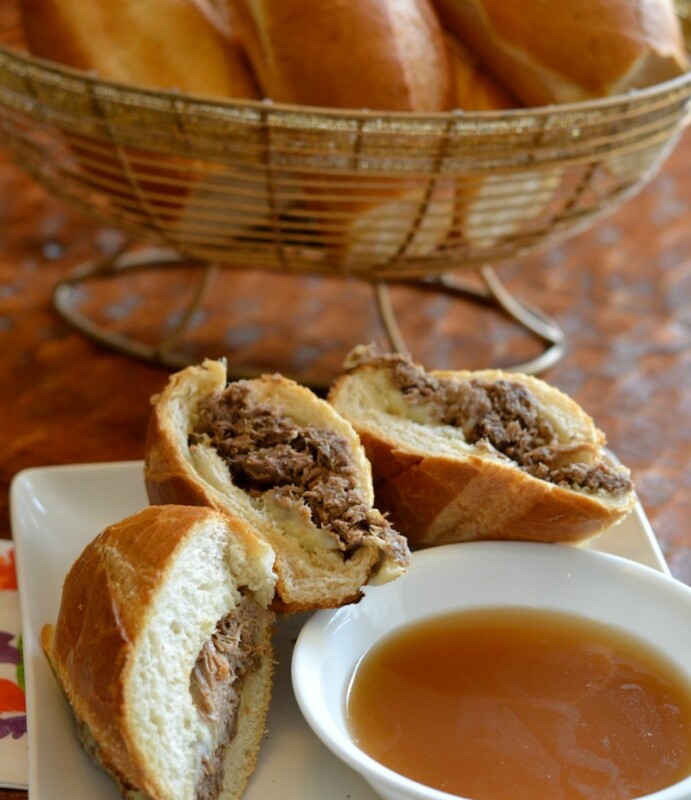 This slow cooker French Dip recipe is not only perfect for a busy weeknight, but also for feeding a crowd. It’s a great alternative to hotdogs and hamburgers when you’re looking for an easy meal for guests that doesn’t require a lot of work. No searing, slicing or dicing required; you just toss in the ingredients, turn the slow cooker on, and go about your day. When you’re ready to eat, simply strain the aus jus, shred the beef, and give the sandwiches a few minutes under the broiler if you’d like to add cheese. In my opinion, horseradish is also a must, but I’ll leave that option up to you. What Type of Meat to Use in a French Dip? In my French Dip research, I came across a few different suggestions for what type of beef cut to use. I went with rump roast (sometimes called bottom round) because that’s what they had at my store. That cut of meat doesn’t exactly sound appetizing, but it was perfect for this recipe! What Type of Roll for a French Dip? Like any good sandwich, the bread is going to be key. Look for a sub roll (or bollillo as they’re called here in Texas) with a crunchy exterior and a soft middle. 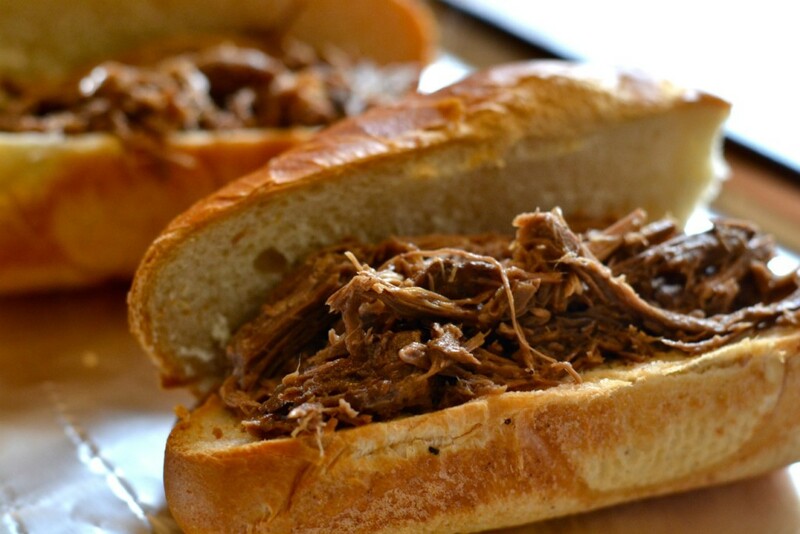 An easy recipe for a French Dip sandwich that cooks in the slow cooker until the meat is tender and falling apart. Combine broth and seasonings in a slow cooker. Add roast and cook on high for approx 6 hours or until meat is easy to shred. Remove meat to a platter and shred, removing any fat. Pour the liquid from the slow cooker into a gravy strainer. Pour off fat from the liquid and divide remaining aus jus into serving bowls for dipping. 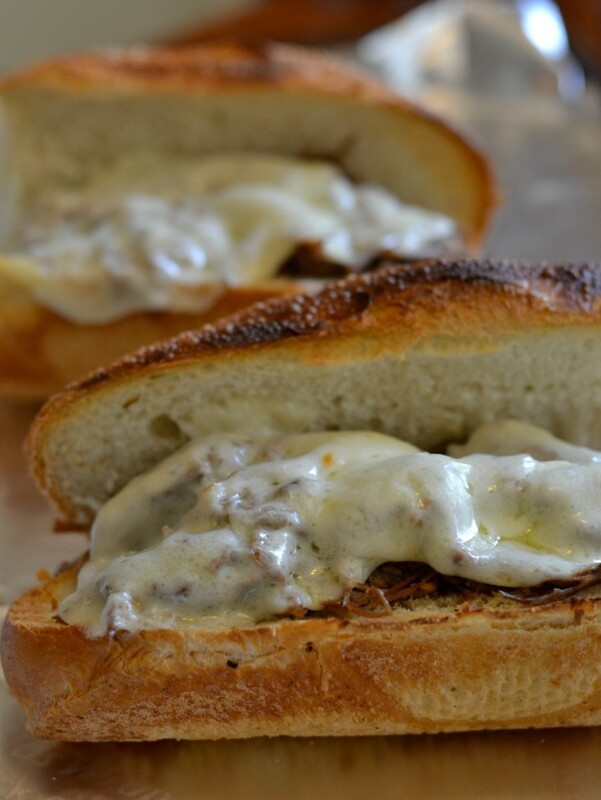 To serve, slice rolls and top with meat and provolone cheese. Heat under the broiler until cheese is melted. Spread with horseradish (if desired) and serve with aus jus. 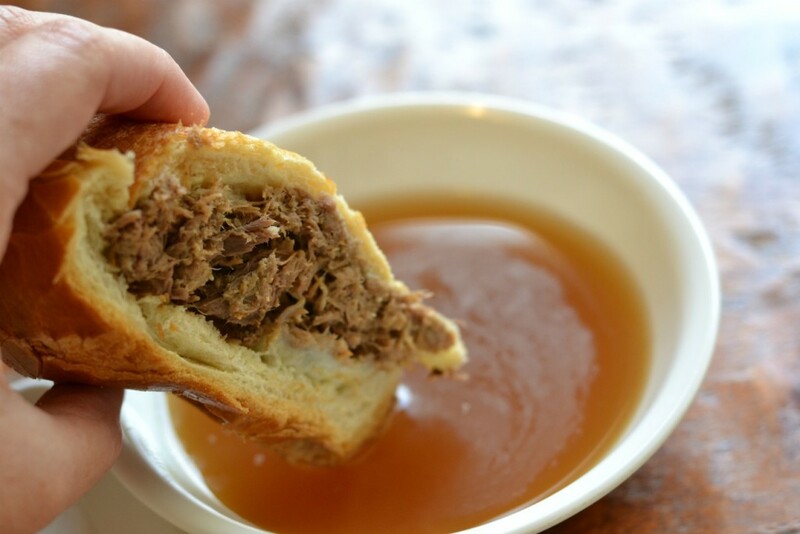 This looks like the kind of au jus that makes you want to drink whatever’s left in the dipping bowl…and by “you” I mean “me,” because I will definitely be doing that.